Yeah - the tuner looks to me like it's reading the note as being sharp. Maybe the person in the shop assumed you were going to install it with the display on the back side of your headstock? There's a "flip" button on those which will switch the display upside down when you install the tuner that way so as to be less noticeable by an audience. 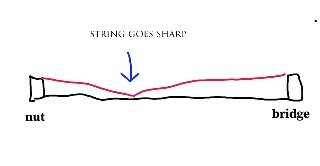 Try to see if you can get it to read right on the note by pressing the string just hard enough to sound the note cleanly. It could be that you're pressing too hard and pushing it sharp. You need a set up to adjust the strong heights. Last edited by Swamp Yankee; 04-08-2019 at 08:11 AM. Thanks for all the suggestions. You all were right (and I was wrong), it was showing the note as sharp, not flat. Next time I’m in the shop I’ll take it in to see if they can ‘set it up’ but for the moment it sounds better with a lighter touch. Thanks, again, everyone.